Police are drafting in 120 extra officers to help patrol the annual Run to the Sun festival in Newquay. 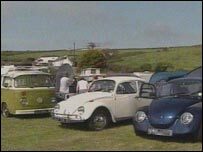 Thousands of people are expected to visit the Cornish resort over the next three days for one of the UK's biggest custom car and Volkswagen festivals. Police say they support the event but have measures to help it run smoothly. Officers said they would take a hard line on troublemakers and are to use number plate recognition equipment to trace any stolen vehicles. Mobile speed detection units will be used and all traffic coming into the county will be monitored. There have been complaints in previous years about cars being driven at high speed in some areas of the town. Police hope the success of an anti-speeding campaign which was brought in last year will be mirrored in 2006. Neighbourhood Police Officers are also speaking to shops in the town about selling high-powered water pistols after some residents were soaked when the toys were fired from inside passing cars. Run to the Sun is celebrating its 20th anniversary. The event started as a meet for Volkswagen enthusiasts and has grown in popularity over recent years. It is now one of the UK's largest custom car festivals. In the past it has attracted up to 100,000 revellers.